Visitors Will Love Your New Ecard System! Why Add an Ecard System to Your Website? It's Easy & Fun - we provide webmasters with a fully functional, 100% customizable ecard application that works with any website. Anyone can do it, and you’ll enjoy the creative process. Surprisingly Inexpensive! – No other ecard application offers so much value for such a low price. No Confusing Scripts - and you don’t need to know anything about coding or programming. Our ecard system tells you exactly how to build the application and we provide you with the complete HTML code – all you do is cut and paste the code to your webpage and your ecard application is up and running. NO ANNOYING ADS - Our ecard application is AD-FREE. The only ads you’ll ever see are ads that you decide to put there yourself. YOU are in full control. Step-by-Step Tutorial - we take you by the hand and show you exactly how to build your customized Ecard application. OUR SERVICE AND PRODUCT IS GUARANTEED. "I am pleased to offer my full endorsement of EcardSystem.com. I signed up with confidence after viewing the video instructions. Even as a website novice, the step-by-step instructions for building the Ecard System and loading it to my site were easy to follow. Richard was very supportive to help me get it done correctly and fast. I have my ecards page filled with my chocolate images and look forward to pleasing my visitors with the ecards. I'm a very satisfied customer." Check out Gloria's customized ecard system. "Now you have even more bells and whistles with our PREMIUM version of EcardSystem. Checkout a live example of our enhanced ecard application. With our Premium version you can add Audio or Music to your ecard images. Also, you can add Video ecards to the mix. 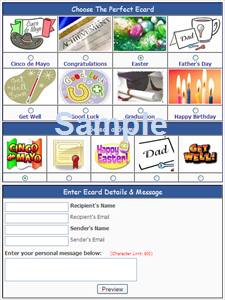 Premium membership includes additional features that include: Scheduling Date & Time that ecards are received, as well as sending ecards to an entire group of receivers at the same time. All this and more.!" 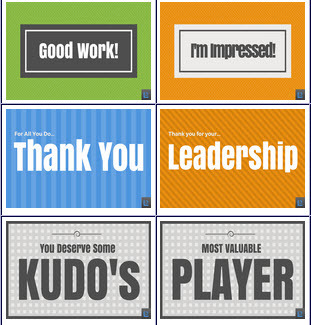 Check out how Leadership-Tools.com is using our Premium Ecard System. Does Providing Ecards Help Drive Traffic? YES! Learn how our ecard system provides more than just a quality, totally customizable, ecard application for your website. In fact, most websites that offer an ecard system to their visitors fail to fully leverage the opportunity that those same photos/images can provide. Create a screensaver program that you can offer as a free gift to visitors who subscribe to your ezine or newsletter? Use a free gift to start building that all-important subscriber list! Add written text, audio clips and/or music, to create a short video clip that is instantly submitted to YouTube.com, Yahoo Video, etc. Viral Marketing at it's finest - and free to distribute! Establish a product store on your website that sells items with your special images on them. For example: T-shirts, mouse pads, coffee mugs, calendars, etc. Just one more additional revenue stream for your website! That’s just the beginning. Our ecard system also provides webmasters with hundreds of examples of real websites that receive a large volume of highly targeted web traffic. We’ll share with you how these websites have become so successful - and more importantly, how you can leverage their proven strategies to improve the profitability of your own online business. We realize that serious webmaster's are constantly seeking innovative tools and resources that allow them to provide added value to their visitors, and at the same time attract an increasing number of targeted visitors to their website. EcardSystem.com is dedicated to providing website applications that effectively address both issues - adding value and increasing traffic..
Our one-of-a-kind Ecard System allows the user to enhance their website by providing visitors with the opportunity to send unlimited, customized ecards to their friends, family, co-workers and acquaintances. Webmasters can now easily offer an Ecard service to their visitors. Our unique web application is hosted on our server, which means that you avoid having to deal with writing any confusing code, and you won’t be required to install any sort of CGI scripts or executable programs either. That's right, let us do all the heavy lifting! Your time is better spent on creating quality content and products for your customers. Once you sign up with EcardSystem.com, you will immediately be taken through the easy process of configuring your customized Ecard System for your website. Choose one of our attractive templates, or totally customize the look and feel to present your ecards in any way you desire. Whether you choose to offer 5 ecards, or 40 – it's totally up to you. The Member's section of EcardSystem.com is where YOU are in complete control. Regardless of your skill level - whether you are a total newbie or a highly experienced webmaster, you will find our ecard system application extremely easy to apply. EcardSystem.com is here to help you build your online presence, as well as your bottom-line. Thank you for allowing us to introduce ourselves. We value your business and are committed to delivering quality service and support. We are so confident in our ability to add value to your website, we offer users an Iron-Clad, No-Risk Guarantee. Don't forget to subscribe to our free newsletter! Discover what makes this ecard system so valuable to webmasters, regardless of their skill level.